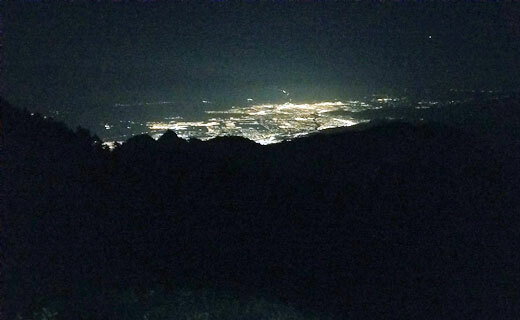 At 6:20PM we got the call for a lost hiker in the San Jacinto Peak area. Riverside Sheriff’s Aviation Unit was able to fly over the peak in high winds and spot the subject and tell us her location before it got dark. Because of high wind they would not be able to do a hoist. We arrived at the Tramway around 8:00PM and quickly made our plans. Eric and I would hike to the Peak while Glenn and Michael would stay back and run base and be available if we needed them to hike up. State Park Ranger Bill was staying over in the Ranger cabin and had cell phone communications with the Subject. Maxie had started hiking late and reached the summit around 4:00PM. She was well equipped with jackets, food, and Water, but no topo map or GPS unit as she though it was an easy hike on trails. But the summit of San Jacinto is a big pile of boulders and once you past the Summit Hut and start up the boulders you can no longer see the Summit Hut. Once on the Summit she took in the view and then started to head down. But she went down the wrong side towards Little Round Valley. She only went down 100 yards or so and realized she was in the wrong place but did not know which way to go. She called the Ranger Cabin number on her permit and spoke to Bill who told her to stay put, do not go walking around anymore and help would come to her. Eric and I left the Ranger Cabin at 9:15PM and headed up. We took the Sid Davis trail as it is the fastest way to the Summit. We got to Tamarack Valley in 30 minutes and reached the main trail up below the gully up to Jean Peak in another 60 minutes. We took a short break and eat some energy food and drank water. We both were just wearing long sleeve shirts and were soaked in sweat. 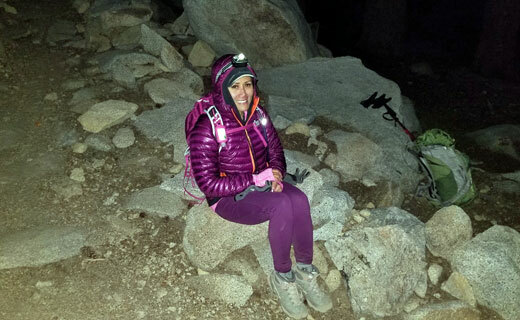 We continued up and contacted Maxie at 11:45PM only 2 ½ hours after starting our hike. She was in good spirts once she saw us. She was cold even with her jackets as she was just sitting since 5PM, almost 7 hours. We thought it was not to cold as we had been hiking hard. In fact, we found out it was 37 degrees at the Ranger Cabin. We wrap her up in a down sleeping bag and gave her energy food to eat and eat more ourselves taking about 15 minutes. Then we started back down to the Tramway. She was a strong hiker and had no problems on the way back. 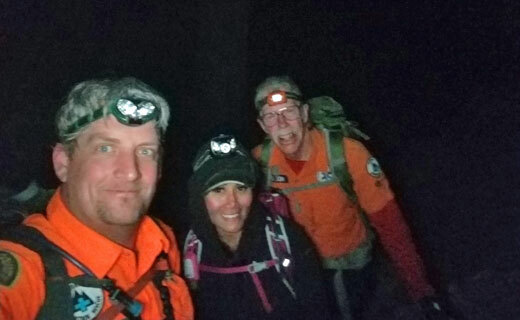 We reached the Ranger Cabin in 2 ¼ hours a little after 2:00AM. State Park Ranger Bill took down information from her for his reports and we relaxed in the cabin for about 20 minutes and then we did the dreaded walk up the tramway ramp and into the upper station to get a few hours sleep. At 6:12AM the lower tram station opened the doors to the car up top and we got in and they closed them behind us and we rode down. A big thanks to the State Park (Bill) for keeping in touch with Maxi by cell phone and running the base radio for us during the mission. Also, to the Tramway Personal who are always friendly and helpful to us during a mission. And lastly to RSO Aviation (Eric Hammun) for perfect directions to the subject. RMRU Members Involved: Pete Carlson, Michael George, Glenn Henderson, and Eric Holden.